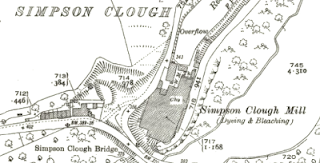 The Simpson Clough Mill, where Union Papertech is located, opened in the 1840s and began life as a fulling mill; which processed wool for use in clothing. By the 1880s, the mill become a dye works under the ownership of Oran T & Sons, and continued to be a thriving dye works until the Cromptons family bought the mill from the Barker Bros in 1939. Soon after Cromptons took over the mill, WWII began and the mill was used as a food store during the war. The mill finally became a working paper mill in 1946 using conventional tissue machines to produce bible paper until 1974 when the paper machines were upgraded and production of specialty filtration paper began. As the rise in tea bags began in Britain, so did the production of tea bag paper at the mill, today the mill manufacturers over 6,000 tonnes of paper every year. In 2006, Simpson Clough, then Cromptons, was purchased by the Puri family and became part of the prestigious Purico Group.